While my lovely friend, Kindness Girl, takes a well-deserved vacation, she left me the keys to this wonderful website. I refuse to believe that the phrase “The inmates are running the asylum” was not specifically coined by someone anticipating this very event. Let me introduce myself: My name is Jennifer. I’m known around the internet as The Checkout Girl but I hardly ever make my friends call me that. I’m a writer, comedian, storyteller, and ukulele enthusiast (On top of being an actual checkout girl, because I prize authenticity. And having health insurance). You may have seen my work here or here but, most likely, you have been blissfully unaware of me, until now. I’m sorry. I’m really, really sorry. It’s 4am and I’m running the pitch black streets of my neighborhood in stretch pants. I’m not the first to do this, I’m sure, but I just might be the first to do it without being on her way to, or in the midst of, an illegal activity. I do a quick scan of my body, from the ground up. Ankles, shins, knees, hammies, hips, tummy, lungs, shoulders, neck. Everything feels fine. Good, even. Oh, and did I mention that I’m grinning like a maniac? Because it’s kind of important. I’m hardly unique. People fall in love with running, all the time. They fill our facebook timelines with their latest stats, and they tweet about how incredible they feel. They check in from the track on Foursquare, and they post pictures of their latest races from their iPhones. For me, though, this is all a revelation. You see, I’m recovered from an eating disorder. From the ages of 19-26, I was a full-blown bulimic. I binged/purged my way to a size 0 and a multitude of health problems (Some of which are still with me, to this day, and always will be). Only when I was pregnant with my second child did I seek help. Eating disorders are often about control, controlling what goes into one’s body, as well as what comes out, so it was exceptionally difficult for me to admit that my extreme need for control had actually left me completely helpless. After all, much of what I’d heard from the people I knew was how great I looked, having finally shed the baby fat I’d been carrying around since, well, since I was a baby, and being married to someone who was a partner in my behavior, most of the time silently standing by while I excused myself after every meal, less frequently asking me if maybe I wanted to go to the bathroom when I sat at the table for too long after I’d finished eating. When you have body issues, they can make you hyper-aware, assessing every tiny detail of your physical self, criticizing things that no one else even notices about you. My problem, however, was the opposite. I completely tuned out of my body, ignoring all signals from my corporeal self. One time I broke my hand by accidentally smashing it in the tailgate of a truck, without even noticing. And I gave birth to my daughter without a peep, a tear, or a drop of sweat. The OB nurse, who was also a friend, said she was going to call for a psych consult, after the birth, if I didn’t snap out of it, because she thought I’d lost my mind, sometime during labor. I don’t remember either event, though, because I was so accustomed to getting going when the going got tough, physically. So, I got help. And, after a year or so of both group and individual therapy, I was hardly purging, at all. Binging, though, was still a constant behavior. I went from a 0 to a 16, quickly. I’m tall, so it wasn’t dire, but I felt really bad about myself. My brain said “You’ve worked so hard and now YOU ARE RUINING IT.” I guess my definition of “working hard”, at the time, must have included laxatives and vomit. Then, my best friend went on a medical fast and convinced me to do the same. Because, if there’s one thing you want to do to a body that’s being completely ignored, it’s starve it. For the next five months, I ate nothing. Not next-to-nothing, but nothing. Instead, I consumed five “shakes” every day. The word “shakes” is in quotes because the only thing that these things had in common with, say, something you’d get at a faux 1950’s diner (Nostalgia! In a strip mall!) was the fact that they were both kind of liquid-ish. Boy, did that program ever do what it was supposed to. The pounds melted away. After a while, though, I got bored with preparing five shakes a day. Who had the time? Besides, I thought, if I was losing weight this successfully by drinking five, just think how successful I’d be with only four! Then three! Soon, I was living on two diet shakes per day, and it wasn’t a problem since I didn’t feel things like hunger and stomach pain. Because the fast was medically supervised, I was pulled off a month early. “Are you eating all of your shakes?” the doctor asked, perplexed by the fact that I was becoming quickly malnourished. “Yes,” I lied, incorporating a melodramatic shrug. Who was this guy, anyway, all up in my private business? I felt indignant, doing my best Tyra Banks “YOU DON’T KNOW ME” head bob and left his office. I had been fired from my diet. As soon as I put solid food in my mouth, again, the weight came back. All 75 lbs I had lost, plus 25 more I’d found at the bottom of a hundred bags of Cheetos. I had returned to binging, like a lover who I knew didn’t treat me right but preferred the company of over being alone. Then, around my 40th birthday, I went in for the usual mammoboobsquish and ladycheckup. As the doctor stepped out to grab some medication samples, I saw that she had written the word “obese” on my chart. I was surprised. I mean, sure, I was probably chubby (I’d long since stopped looking in any mirror that was large enough to reflect anything more than my face. ), but obese? Geez, doc, buy a girl a drink first! For some reason, it really bothered me. To this day, I could recreate the doctor’s penmanship, perfectly, just from memory. It’s that burned into my brain. Also burned into my brain were the results of those tests the doctor had taken. I had developed Type 2 diabetes and my cholesterol was over 300. My liver and kidneys were also struggling, having been overtaxed by my high blood sugar. I decided I’d better get my poop in a group. Except for Brad Pitt in that Benjamin Button movie, none of us are getting younger, and I knew that changing my lifestyle wasn’t going to get any easier, as the years flew by. So, I slowly cleaned up my eating, then decided to try out a combination of running and walking that I’d read about. I remember in week 5 of the 12 week program, the instructions were to run for 20 minutes straight. No more walking, in between. I was scared out of my mind. I thought “I’m not only fat, but I’m 40! Clearly, these people are trying to kill me!” But it didn’t kill me. In fact, it wasn’t even that difficult. My body somehow knew just what to do, falling into a comfortable stride and taking in deep, cleansing breaths. And, speaking of my body, I’ve started feeling it, again. Running has forced me to hear its signals, for the first time in years. If my hamstrings feel tight, I take longer strides to stretch them out. If my shoulders get sore, I relax my upper body to release some of the tension. If my knee feels a little pinchy, I turn around, walk back home, and ice it, while sipping on some post-run chocolate milk (my favorite thing in the world). Another advantage of being back in my body is it has made eating so much easier. I now trust my body to tell me when it needs more of something, including calories, and it does. I crave exactly what I need. My body says “carbs”, “protein”, or “fat” and I honor it by answering the call. And I don’t binge, because I don’t confuse the signals for “hungry” and “upset”. They are vastly different, and I just have to take time to notice. I recently went back to see my doctor, who promptly unprescribed both the diabetes meds she had put me on, and gave me a hug when I told her the story of my body and I. She shared with me that she, too, had engaged in disordered eating, for years, before figuring it out for herself. Barring the invention of the time machine before I go gentle into that good night, I’ll never get back the things I missed while in my eating disorder. I’ve asked my now 17-year-old daughter if we could recreate her birth, but she gave the very sane response of “I respectfully request another mother.” I know that that particular ship, as well as a lot of other ships, has sailed, and I’ve made peace with it. My intention, from here on out, then, is to not waste another moment, wrapped up in unhealthy thoughts and behavior or to cut those things short, when they do make an appearance. And to keep on running, and grinning. I have faith that, if I just listen to my body, that won’t be a problem. The kid and I, totally NOT recreating her birth. Boo hoo. Will you be joining Team KindnessGirl to run/walk Color Me Rad, on July 21st? If so, send us a shout, including your mailing address, to Patience@KindnessGirl.com and don’t forget to introduce yourself, before the event. I’ll be the one with the bright pink hair and a big smile on my face. Can’t wait to meet you! Beautiful post Jennifer!! You GO!!! See you at Color Me Rad!!! Cindy – Color me excited! See you there. I really needed this today. For so many years I think I was just lucky. I was a dancer, so it didn’t matter what I ate; it disappeared quickly in the hours of classes and performing. I got the usual early 20s creep, then after a bad breakup, I completely let go of control and ate myself silly. I did it again when my husband was deployed to Iraq. I actually sat there and thought – who will care? I can eat whatever the hell I want, and no one will be there to witness it or care. The screaming baby didn’t count. Fast forward to 41 years old, and the weight is nearly unshakable. I have back problems, hip problems, breathing problems, and 7 and 4 year old boys who want me to wrestle and play tag. I want to! I started that same program, but I make excuses for not doing the sessions, and it gets harder and harder to go back to it. What kept you going? Thank you for your honesty here. 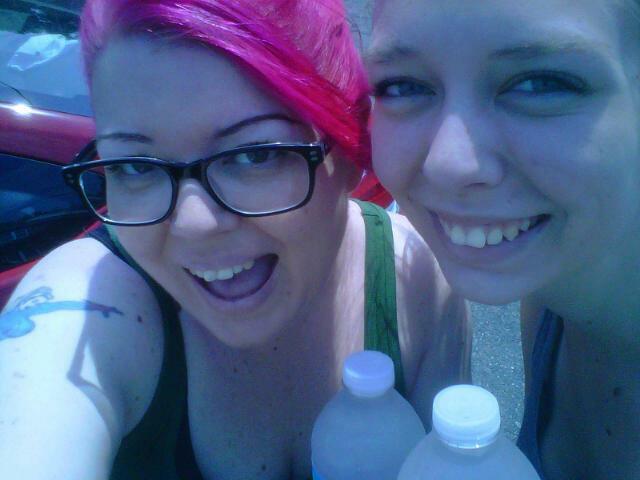 I’m the one with the pink hair. Go figure. Also, I replied to you below. Not sure why it didn’t show up as a reply. I can’t be trusted to use the internet responsibly. ….beautiful! Thanks for allowing us to share in your story. Keep grinning! Jennifer – I feel you so hard, right now. Please know that there are plenty of days I make excuses not to run, and the first few miles of EVERY run I do, no matter how motivated I am, have me feeling like “Who the hell would ever do this ON PURPOSE? ?” I do well to remember that exercising is a choice and I can either do it or not do it and it doesn’t make me any less valuable as a person if one day I choose “not”. I don’t ever want it to be something I have to do to like myself. Even if I never laced up my running shoes again, I’m still super rad, and so are you. Now, embrace your radness and go for a walk. Being outside, if even for fifteen minutes, will change your head. And never forget… you are loveable. This is heartening to read, as running can become as much of a disorder as eating can. wow did i need to read this today, having just emotionally eaten an obscenely large piece of cake for breakfast. i blame it on baby weight, on nursing need, but my truth is i’ve always had an unhealthy relationship with food and with my body…ranging from bouts of anorexia to my current binging. thank you for the wake up call and for forcing me to also ingest a little self honesty this morning. this is why i love you. well, that and the ukele. now i just have to find the self love to take action. Sara – Lady, I am crazy about you. Let’s go for a walk, then share some cornbread. That’s a good compromise, right? Jen, everything you write is addictive. Every damn thing. You’re an inspiration and a BFF-glamazon in one terrific package. Glad Patience gave you the keys so you could clue us in on the importance of showing kindness to own selves first. ‘Cause charity begins at home, doesn’t it? As I start week 1 day 1 of “couch to 10K” (for the 4th time!) this will be my mantra. And I just might get up at 4 am to do it too…beofre the kids wake up, before the husband leaves for work…before it’s too late. Shannon – Remember, you are perfect, right this very minute. If you change, you will be perfect, then, too. I love love love the “Couch to” programs. I never would have been able to just say “I’m going to start running now”. I’m not the least bit athletic and it may have never even occurred to me to do so, in the first place. Just remember, week 1 day 1 is the hardest. Every day after that will find you stronger. I am delighted to hear from you! welcome…. Hi Jennifer. I am Bessie. Thank you for your honesty and for sharing about yourself and the struggles that you face and the solutions you have found. Hang in there and I wish I was close enough to participate in the Color Me Rad event. It appealed to me when Patience first mentioned it. I recently dropped out of a 10 week challenge for weight loss, I just was not making progress and did not feel I was getting the support I needed. So, I gave up on that challenge, so I will find a different avenue of weight loss. I went to your twitter page BEFORE reading this piece and was practically falling out of my chair laughing at your tweets and then I read this….. What a brave person and then to be so damn hilarious on top of that! Coping mechanism for life’s struggles….really glad to have discovered your humor through Patience. Thank you! Saw you running at Color Me Rad!!! 🙂 You are awesome!